While researching our desert documentary, Exquisite Wasteland, we discovered an alarming story. Just 20 miles north of Las Vegas lies the Desert National Wildlife Refuge; the largest in the Lower 48 States. The Refuge protects one of the most pristine deserts in the American Southwest and provides critical habitat for more than 1400 species of plants and animals, including one of the greatest concentrations of desert bighorn sheep on the continent. It is also a Native American sacred site protecting petroglyphs that date back thousands of years. In 2016, the Air Force announced plans to withdraw 300,000 acres from the Wildlife Refuge for use as a bombing range and aerial combat training. Military use threatens this extraordinary desert wilderness and will close the Refuge to the public; all scientific and recreational opportunities will be lost. The final decision will likely be made this year. In January we received a grant that provided funding for ten days of shooting. We spent three days on the Refuge producing one of the central stories for Exquisite Wasteland. Given the urgent threat of military takeover, we are also producing four web videos to support Friends of Nevada Wilderness and their campaign to save the Desert National Wildlife Refuge. Donations will support the post production of three new videos. 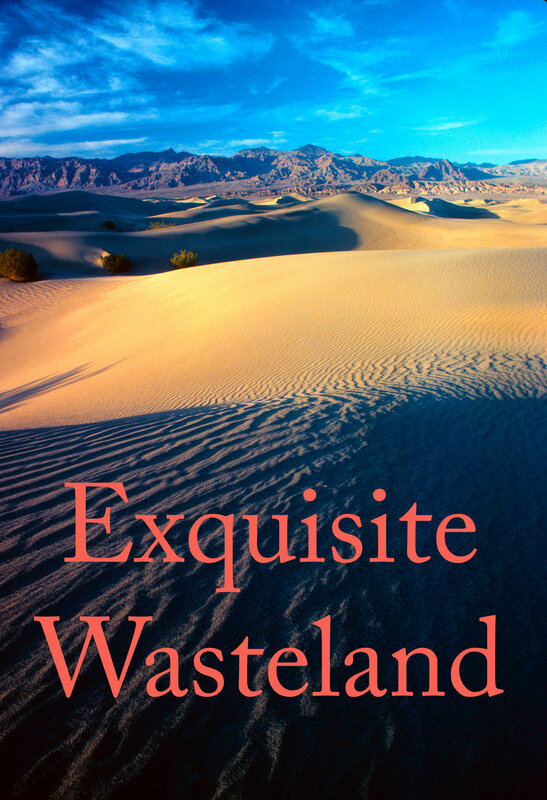 “Exquisite Wasteland” explores the magnificent deserts of the American Southwest - one of the largest intact ecosystems remaining in North America. The film considers how the popular perception of desert as a worthless and barren ‘wasteland’ has provided rationale for the exploitation of pristine lands without question or consequence. Currently, an explosion of industrial and military development is underway on exquisite deserts throughout the West. Protected public lands - even National Monuments and National Wildlife Refuges - are threatened with oil exploration and extraction, uranium mining, water harvesting, massive development of utility-scale energy projects, nuclear waste dumps, urbanization, and military seizure for weapons testing and combat training. A coalition of stake holders including traditional conservationists, young activists, recreation enthusiasts, urban residents, scientists, and Native American tribes have found common ground. This vocal constituency is rising in opposition to what they see as a comprehensive and premeditated assault on some of the most magnificent public lands remaining in the US. The charge is being led by inspiring leaders who are determined to make a difference. Exquisite Wasteland is an eye popping filmic journey that provides a window to one of the greatest concentrations of biodiversity on Earth, as well as illuminating a human story that dates back at least ten-thousand years. The film will explode the myth that deserts are nothing more than a barren and worthless wasteland. On the contrary, they are extraordinary landscapes teeming with a staggering abundance and diversity of life, and deserving of our protection. Acquisition: 4K Digital Theatrical & Digital Release: 4K & 2K with Surround Sound. “Wild by Nature” explores, amazes, and inspires as it celebrates the nation’s natural wonders and historic sites in state parks across America. The series informs our understanding of who we are as a people and issues a clarion call to protect our priceless parks into the future. At its core, Wild by Nature will introduce individuals who have dedicated their lives to protecting parks across the country: scientists, activists, and adventurers who are wild by nature. Wild by Nature will take viewers on an unforgettable journey to both familiar and hidden places. The American landscape in all its grandeur takes the central role, inspiring citizens to stand up for preservation. Far more than just pretty pictures, each episode features incisive interviews, compelling characters, and sparkling narrative that all contribute to this singular celebration of America’s natural and cultural heritage. Acquisition: 4K Digital Digital Release: 4K & 2K with Surround Sound. A clip from our Visitor Center film for Calaveras Big Trees State Park in the Sierra Nevada Mountains. Join botanist, Anthony Ambrose as he climbs more than 250 feet into the crown of a giant sequoia to study the impacts of global warming on the iconic trees. Acquisition & Projection: 2K digital video. Preview Clip for Episode One of California Forever; a two-part PBS television special that tells the story of California’s magnificent state parks from Yosemite in 1864 to the present day. Acquisition: 4k on Red One Release: 2K with 5.1 Surround sound. Preview Clip for Episode Two of California Forever. The program places the future of California State Parks within the context of emerging trends that will soon threaten parks everywhere. Population growth, decline of native plants and animals, loss of open space, and climate change all pose serious challenges to the integrity of parks now and in the future. Angel Island State Park in San Francisco Bay holds an important story for Chinese Americans. Given the current debate surrounding the issue of immigration, it also provides a cautionary tale for all Americans. The Angel Island Immigration Station was an internment camp set up to keep Chinese immigrants out of the US. This state park holds an important chapter of the American story. California Forever is two-part PBS television special tells the story of California’s magnificent state parks from Yosemite in 1864 to the present day. Together, the programs remind viewers of the importance of California’s State Parks as well as their priceless legacy. In the Southern California desert, conflict between off-road vehicles and traditional park users comes into sharp focus. What is a park? Mechanical playground? Or nature preserve? On one side are traditional nature lovers seeking the remarkable solitude and silence of the desert. On the other; passionate off-roaders who also treasure open space, but for different reasons. Three “Video Rivers” flow through the Grand Teton National Park Visitor Center. Each Video River is 15 feet long and 4 feet wide and are rear-projected onto transparent glass panels set into the floor. As the visitors stand or walk on the Video Rivers, images from the park are presented from four seasons. Acquisition: 35mm Eastman Color Negative Release: 2K Digital with stereo sound. Host and Narrator: Harrison Ford. This 60-second spot argues for the restoration of the Hetch Hetchy Valley in Yosemite National Park. Dammed and flooded in 1923 to provide water to the city of San Francisco, the battle for Hetch Hetchy is recognized as America’s first national conservation campaign and marks the birth of the modern environmental movement. A meditation on place that invites visitors to experience Yosemite on an emotional AND spiritual level. The goal of the immersive film is to inspire the casual visitor to establish a personal bond with this extraordinary place. A one-hour documentary tracing Paul Winter’s musical journey through the Grand Canyon. In 1978, the price of oil soared and domestic reserves plummeted resulting in long lines at gas stations. President Carter declared an ‘energy crisis.’ When David Vassar learned about a group of young environmental activists, engineers, and artists who were building a windmill to generate electricity on a remote island off the coast of Massachusetts, he sensed a story. After raising independent financing from his lawyer and landlord, David spent a solid year documenting the construction of the giant wind turbine. It is an engineering story as well as a story about the American spirit, but most of all it was a story about generating power from a renewable resource. In 1979, the Cutty Hunk windmill was the largest wind turbine ever constructed for the generation of electricity. It wasn’t built by General Electric or funded by the Department of Energy, it was built by hand with private money from small investors. Although retired from service, the Cutty Hunk windmill provided ‘proof of concept’ for what is now a ubiquitous source of renewable energy.